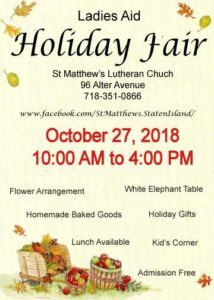 Holiday Fair | Welcome to St. Matthew’s Lutheran Church on Staten Island, New York. Welcome to St. Matthew’s Lutheran Church on Staten Island, New York. “…Telling What He Has Done” since 1915. Holiday Fair is sponsored by the Ladies’ Aid Society, the Holiday Fair is held generally the first Saturday in November. The same wonderful items are featured, but in a Fall or Christmas theme. The fairs offer handmade crafts, home-baked goods, a white elephant table, and a delicious lunch menu of sausage and peppers or meatball heroes followed by dessert! While Strawberries are not on the luncheon menu at the this fair, homemade soups are a welcome substitute. Funds are raised to help the needs of the Church, and the community enjoys one of the nicest church fairs on Staten Island. The next Holiday Fair will be on October 27, 2018 from 10AM-4PM.